James Heaslip, Alan Maxwell, and Fergal Leonard. Photo: Mike Shaughnessy. 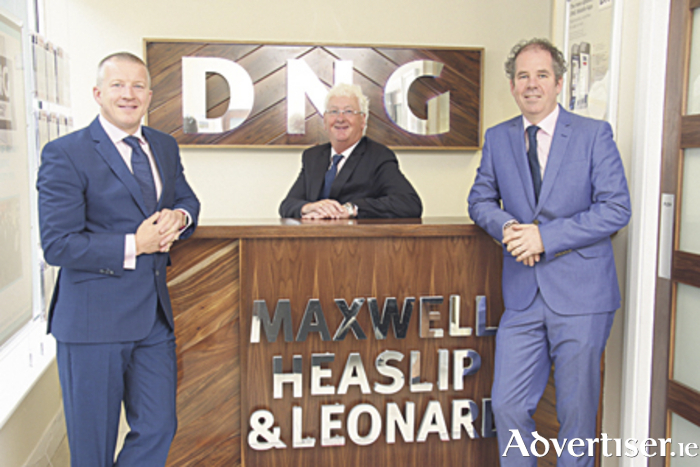 Well in the throes of open viewings, contract requests, and enquiries regarding auction day, the offices of one of Galway's leading local agents, DNG Maxwell Heaslip & Leonard, are a hive of activity in preparation for what promises to be an exciting and busy auction day. This weekend will see the final Saturday of open viewings on properties, rounding up what has been a busy auction run for the DNG team. He added: “It’s not unusual for people to see the properties for the first time auction week, however usually the emphasis shifts to contracts at this time. We provide an online data room where prospective purchasers can download the legal packs for each property. Purchasers can request access to the data room by logging onto dnggalway.ie/auction and clicking on the ‘legal documents’ button located on the property they are interested in. Our auction team are busy responding to all document requests this week." Heaslip is keen to stress that the companys’ success is ultimately down to teamwork: “We put a lot of resources into our auctions and it pays off – our clients are very happy and we all get a sense of achievement at the end of a long but successful day.” With more than 30 lots coming to the auction floor, properties include both commercial and residential units and are dispersed throughout Galway city and county, Roscommon, Mayo, and Clare. This three bed semidetached house is located in the heart of Tirellan Heights and in walk-in condition. Built in the mid 1970s, this property has been modernised recently and is presented in excellent condition and ready to immediate living. Located with all amenities on the doorstep to include Tirellan NS, crèche, a city bus service running through estate, Menlo Park Hotel, Dunnes Stores, Headford Road SC, and only 20 minute walk to the city centre and NUIG, this property will make an ideal starter home. It comprises an entrance hall, sitting room, kitchen/dining room, bathroom, three bedrooms with master en suite, one bedroom on the ground floor, plus a rear block built shed, patio, and side entrance. Spacious two bedroom first floor apartment, within a small exclusive development of just three apartments. Maunsells Court exudes character and presence, and was constructed at a time when spaciousness of accommodation took precedence. Situated on a partially elevated site, the entrance is approached via sweeping steps, with well tended gardens to both front and rear, while parking and private storage sheds are to the rear of the development. Without doubt an excellent opportunity to acquire a city property within an area where properties seldom come to the market, and are highly sought after. A three bedroom semidetached property located just off the main Ballybane Road, which comprises c947sq ft of living space and requires some minor refurbishments. Adjacent to all amenities and within walking distance of GMIT and the major employment hub on the east side of the city, this property presents a wonderful investment opportunity or indeed a potential starter home. An outstanding detached bungalow residence adjacent to Cregmore Cross on the outskirts of Galway city. Comprising almost 1,235sq ft, this recently refurbished family residence is in pristine condition, with all mod cons, and should appeal to those seeking a starter home in walk-in condition. On a site of 0.35 acre, the house has mature gardens and is being sold with a large detached garage. Cregmore National School is just metres away and Galway city is just 15 minutes from the front door. Located just a short walk from Galway city centre this end terrace property has been fully modernised and is a perfect starter home or investment opportunity. With four bedrooms including a large ground floor en ,suite and 95sq m of living space everything is in pristine walk-in condition. Coole Park affords a very accessible location that is sure to appeal to city dwellers. The property is owner occupied. Located opposite the main entrance to Ashford Castle this beautiful dormer home overlooks a serenic woodland beside the world famous village of Cong. Appropriately named, The Tree Tops stands on a mature site of 0.7 acre which has been meticulously looked after and includes extensive shrubbery, lawn, and a wild garden. With 110sq m living space this home is perfect for a growing family or would be an ideal bolthole away from it all but within easy reach of many amenities including Lough Corrib. Recently, completely renovated, detached four bedroom house comprises c1720sq ft of bright spacious living accommodation and boasts a B energy rating and a southwest facing rear aspect, allowing natural light to flow through the house and its extensive gardens from morning to evening. Ground floor accommodation comprises a large kitchen/dining room, spacious living room with natural gas fire, downstairs wc, fitted office, and separate utility room, with solid walnut and tiled flooring throughout. First floor accommodation comprises four bedrooms, with main en suite and the main family bathroom, which includes the added indulgence of a Jacuzzi type bath with power shower. An Cheathrú Rua or Carraroe is in the heart of south Connemara Gaeltacht and is a thriving hub of activity and tourism just 37km west of Galway city. This property with 60sq m of living space has previously been used as a children's creche but is perfectly positioned on the village edge to provide a superb starter home or a holiday residence in this beautiful part of the world. Standing on c0.35 acre, the property is serviced by mains sewer and all other services and has no doubt great potential for redevelopment. A large five bedroom period residence close to the centre of Oughterard. On a wonderful site of over one acre, the mature gardens have over 400ft of riverbank frontage on to the Owenriff River. Comprising c325sq m of living space, the house is in need of refurbishment but has the benefit of full planning permission to renovate and extend, to include a detached garage. The site is also zoned residential which may lend itself to further development subject to planning. Within walking distance to all amenities and just 30 minutes from Galway city centre. A well located premises in the centre of Gort. The building is divided into ground floor retail space (with tenants in situ ) and first and second floor residential space (vacant ). In need of upgrading, the building is in a most prominent location fronting on to both the Square and on to the N66 (Crowe Street ) Galway-Limerick road. Comprising approximately 200sq m over the three floors, the property has excellent potential and will appeal to those seeking a good investment in a busy market town. This four bedroom semidetached private dwelling located close to Tuam town centre. Accommodation comprises kitchen/dining, living room, utility, wc, four bedrooms, and a bathroom. Property enjoys a spacious garden to the rear. A detached bungalow residence positioned in the heart of Loughrea town within easy access of schools, shops, Loughrea Cathedral, and the lake. With 95sq m of living space this is would make a superb investment or townhouse home. Occupied until recently, this house is in walk in condition and has been well maintained. Quality built three bed end of terrace house, located in the village centre of Claregalway with all amenities on the doorstep including national school, new secondary school, church, SuperValu, and all amenities. Ideally located within easy reach of Galway city, many surrounding business estates, and a central point of access to Tuam, Roscommon, and Mayo. The home includes a sitting room with open fireplace, kitchen/dining room, wc and whb on the ground floor, with three bedrooms, master en suite, and main bathroom on the first floor. Cuirt Na hAbhainn is a high quality residential development built on a magnificent site in the heart of Claregalway. Ideally located within ease of access of Galway city, many surrounding business estates and the central point of access to Tuam, Roscommon, and Mayo. With excellent internal and external specifications this three bed mid-terrace house, comprising c1,057sq ft is a superb property, and would make an ideal home for a first time buyer. High quality residential development built in the heart of Claregalway. Ideally located within ease of access of Galway city, many business parks surrounding Galway city, and a central point of access to Tuam, Roscommon, and Mayo. With excellent internal and external specifications this three bed mid-terrace house, comprising c1,057sq ft, is a superb property, and would make an ideal home for a first time buyer. A detached three bedroom bungalow residence in need of refurbishment, with a former cottage to the rear, in Carraroe, Co Galway. Set on a large site of approximately 1.2 acres, the house and outbuilding are suitable for development, with an existing septic tank in place. The main house comprises 850sq ft of living space and offers huge potential to both those seeking a well located holiday home, or an owner occupier looking for a family residence with room for further expansion. Located close to the village and adjacent to all amenities in a scenic location. A well located commercial premises in the centre of Gort town. Adjacent to AIB overlooking the Square, this three storey property comprises approximately 430sq m to include a ground floor retail unit and a basement which was formerly in use as a licensed premises. The first and second floors have recently been partially renovated and are suitable for residential use. An ideal opportunity to acquire an impressive building in the town's most high profile location. Other properties included in the July 28 auction include four plots of land at Ballinahown, Inverin; No 29 Cluain Fraoigh, Lanesboro Road, Roscommon, AMV €80,000; No 9 Larch House, Drumgeeley Hill, Shannon, Co Clare, AMV €30,000; Old Hall Apts, Tuamgraney, Co Clare, AMV €90,000; Nos 1, 2, and 3 The Old Mill, Castlerea, Roscommon, AMV €75,000; retail unit, O’Ruaidhain Court, Ballinrobe, Co Mayo, AMV €25,000; and No 11 The Oaks, Frenchpark, Roscommon, AMV €47,000. The auctions take place on Friday, July 28, in the Radisson Blu Hotel, Lough Atalia at 3pm. Further details are available on dnggalway.ie or by contacting the agents on 091 565261.